Bedfords like this turn up quite often in die-cast form, either modern-day reproductions from Corgi or similar, or else Dinky toys from the 50s and 60s. Tinplate versions of the Bedford CA (or CAL, as strictly speaking it looks like the long wheelbase version) are a lot less common. It has been painted to look like a Police van of the day, and the interior lithographed nicely with a fairly comprehensive 'dashboard', and stripey seat covering. The friction drive motor is mounted in the rear and drives the back wheels, just like the real van! The front end trim is present on this example, and is a one-piece pressing that incorporates the headlamps, grille and bumper. Had this been missing, it would really have spoilt this particular toy. 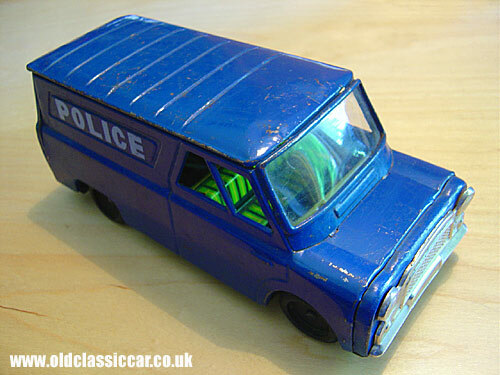 Colour: blue, with Police decals.